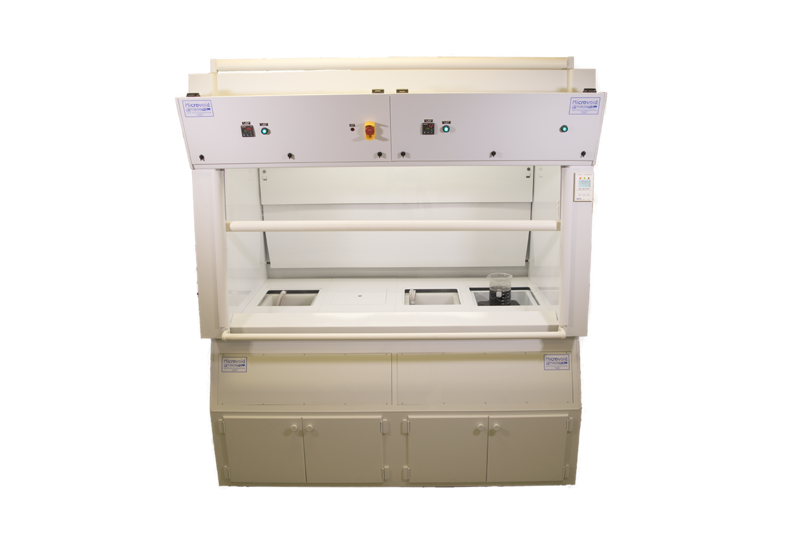 WPS CS-50D HP Chemical Wet Process Station | Air Control, Inc.
For several years Air Control has been manufacturing Lab Crafters’ Patented Air Sentry® High Performance Laboratory Fume Hood in 100% plastic construction, for applications where coated or exposed metal cannot be tolerated. Now, Air Control introduces a new revolutionary model to its long standing high quality Microvoid® line of wet process stations – The Microvoid® CS-50D – utilizing the Air Sentry High Performance technology. A full wet station-width leak containment tub/exhaust plenum, underneath the work-surface. A wide array of chemical processing heating baths, rinse tanks, and process tooling (spinners, hot plate wells, heated ultrasonic cleaning tanks) available for ‘flush/recessed’ installation within the wet bench. Lip exhaust around all bath or well perimeters for localized high velocity fume containment. Complete PLC/HMI interface and control of all wet bench system parameters traditionally available in all Microvoid® Wet Process Station models. All safety systems and interlocks/inhibits, alarm hierarchies, and BMS communications capabilities available in all Microvoid® Wet Process Stations.